Electronic, chemicals, but also radioactive waste is dumped in illegal landfill sites, buried, or dispersed into the sea. “Illegal” does not only refer to the dumping of the waste, but also to its transportation, or management of landfills in violation of international or domestic legal provisions. International legal instruments – specifically the Basel Convention which gathers 180 Parties – define ‘hazardous’ waste on the basis of the pollutants it contains such as lead, mercury, cadmium, chromium, arsenics, etc. (1) Together with the definition of hazardous waste, international provisions stress the international ban to import any sort of hazardous waste to African states parties to the Bamako Convention, from any state not part of it. The Bamako Convention uses a format and language similar to that of the Basel convention, but it is stronger in referring to the prohibition of all imports of hazardous waste; it does not make exceptions on certain types of hazardous waste (like those for radioactive materials) made by the Basel convention. Despite the formal ban of all exports, illegal trade and dumping of hazardous waste has become and remains a global threat affecting major producing and importing countries. As demonstrated by different Interpol operations(7), through worldwide routes going from Europe, North America and Japan to South-East Asia and Africa, brokers and traffickers have deployed well-organized networks able to illegally dispose or dump hazardous waste. Regional flows are also well-established. The destination of hazardous waste is not a mere coincidence. While China or India accept huge amounts of waste in order to recycle and recover raw materials, African countries are looking for second-hand material usable eventually after repair. Assessing the link between illegal trade of e-waste and criminal activities is a difficult endeavor in consideration of the undetermined extension of grey areas in the waste business. In this regard, UNICRI is taking part in the “Countering WEEE Illegal Trade project (CWIT)” led by Interpol. This two-year research project aims to analyze the illegal flows of e-waste, highlighting connections with other criminal activities, and identifying the criminal networks involved. Illicit waste trafficking is a serious threat for destination countries where untreated hazardous waste is dumped into the ground or waters, or manually disassembled with little or no regard being paid to health and safety issues for the population, and to the enduring damages caused to the environment. 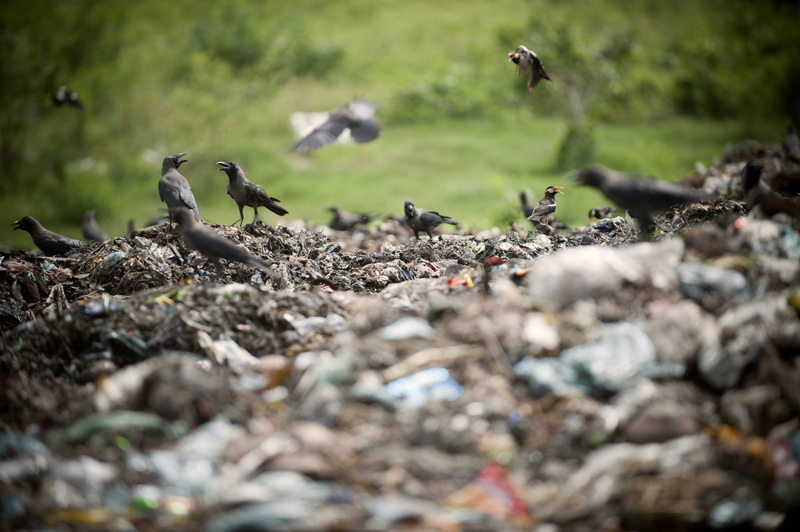 Illegal waste management represents however, also an increasing threat for producing countries, as a consequence of fraud, and tax evasion, but also “pollution” of the legal economy by criminal actors through money laundering and control of legitimate companies active in the waste management sector. Waste trafficking is a crime facilitated by the corruption of public officials in charge of permits, law enforcement and customs as well as politicians, who can ease the solving of bureaucratic issues related to the achievement of permits and document falsification(9). In order to have a better understanding of this risk, UNICRI is carrying out a research on the interactions between environmental crimes and corruption. The study will identify risk and vulnerability factors for the development of more effective strategies in tackling environmental crime and curbing corruption. Corruption is a key factor in those countries where instability is at its most as a consequence of economic crisis, civil war, or poverty. (10) A remarkable example of how illicit waste trafficking is prompted by instability is the case of Somalia. The civilian conflict that affected Somalia for more than 20 years, the absence of the rule of law and respect for human rights encouraged Italian mafia groups and corrupted public officials to enter this area. In 2006, the Italian Parliamentary Commission investigated on the possible link between waste and arms trafficking(11); in this regard, evidence was found that conventional weapons were given to armed groups involved in the civil conflict in return for sites where hazardous waste of all kind was buried, dispersed or even burnt. Still today, Somali people are suffering from the consequences of this illicit waste trafficking from toxic and radioactive waste: deformations to the urinary system, cancer and childhood leukemia. Europol noted an increase in the volume of illegal trade between the European Union and the most affected destination countries in Africa and Asia,(12) where in most cases recycling infrastructure for hazardous waste is weak with dramatic consequences for human health and the environment. A report by the ILO provides a clear description of the bad working conditions of workers in the waste sector in these countries, highlighting the link with numerous serious diseases. The presence of these kinds of actors prompts the distortion of market and of the rules of fair competition. Firms offering a safe and sound disposal of the waste will be forced to leave the market or lowering the price and the quality of their services in order to compete with brokers and criminals. In conclusion, waste trafficking and illicit waste management increasingly pose a threat for the socio-economic stability. In this regard, it is essential to raise awareness of the international community, enforcement agencies, environmental organizations and civil society, on the quantity of hazardous waste generated, the dangers posed to health and environment, but also on the negative impact on the legal economy and the serious crimes involved. With these objectives, UNICRI in collaboration with UNEP has organized a high-level International Conference on current and emerging threats posed by environmental crime which produced a Plan of Action with recommendations on the way forward(20). As requested by the United Nations Economic and Social Council in its Resolution 2012/19, UNICRI in close partnership with experts and institutions at the international level(21) will continue conducting research on different forms of transnational organized crime, including those having an impact on the environment. is currently involved in UNICRI’s research on environmental crime and money laundering. She is also the author of “Ecologia Femminile Plurale”, a book on environmental issues in the Veneto Region sponsored by the Eco-Institute of Veneto “Alex Langer”. is graduated in New Technologies Law and Intellectual property. She is engaged in the activities of the UNICRI Emerging Crimes Unit on Environmental crime, Cybercrime and Data Protection issues. (1) The main Conventions regulating hazardous waste and dealing with illicit waste trafficking are: the Basel Convention on the Control of Transboundary Movements of Hazardous Waste (1992); the Bamako Convention on the ban of the Import into Africa and the Control of Trans- boundary Movement and Management of Hazardous Wastes within Africa (1998); the Rotterdam Convention on the Prior Informed Consent Procedure for Certain Hazardous Chemicals and Pesticides in International Trade (2004); the Stockholm Convention on Persistent Organic Pollutants (2004). (2) Interpol (2011). “Strategic analysis report on illegal export of electronic waste to non-OECD countries”. (14) UNU/StEP Initiative (2013), “Solving the E-waste Problem (Step) Green Paper. Transbondary Movements of Discarded EEE”. Available online at: http://isp.unu.edu/publications/scycle/files/ewaste_flow.pdf. (18) The term “Ecomafia” was first introduced in Italy in 1994 by the NGO Legambiente, with the report The Ecomafia Report and its effects. Nowadays this term has entered in the common language to indicate sector of the Mafias involved in illicit activities posing serious risk for the environment.